…Anthony Bourdain, American Chef and TV Personality. In food production and operations, planning of menu is an important task. If the chef plans the menu in advance, it is easy to deliver ready food items on time. A ready menu can help organize the food preparation and ensures the chef cooks not only tasty but also healthy and nutritious food. It also helps in reducing wastage of food items and cooking fuel resources, and thus saves money. Menu planning also facilitates purchasing and storing required food items. If a food preparation organization is providing multiple cuisines from all over the world, menu planning makes the theme easy. Menu is the detailed list of food items offered at the food service establishment. Menu planning is nothing but selection of menu for an occasion or otherwise. Menu can be different for different meals of the day such as breakfast, lunch, brunch, and dinner. It is a sequential serving of dishes or the sets of dishes under a meal. A meal can contain at least three to at the most eleven courses. There are two prominent types of menus − The food menu, beverage menu, and bar menu. The structure of food menus largely depends on the type of cuisine, time of the day, and serving styles. The dinner menu is generally arranged course wise. For Example, Appetizers, Starters, Main Course, Desserts, and Beverages. d' hôte − In this type, multi-course meals with limited choice are charged at a fixed collective price. It is also called prix fixe, set meal, or set menu. Food in the menu is kept ready. La’ Carte − An individual dish in the list is priced separately. Food is cooked to order and hence takes longer time to deliver. Event Menus − These are organized for events such as wedding, birthday, anniversary, and similar other. Such menus are designed well in advance by considering availability of seasonal ingredients. Ethnic Menus − They are designed as per the cultures, their eating preferences, tastes, and habits around the world. For example, Indian, Chinese, Thai, Kosher, African, and a few similar ones. Theme Menus − It reflects ambience of the theme based food joint. Hospital Menus − A dietician is generally involved while compiling such menus to ensure the recipient eats healthy food always. The patient has least choice. 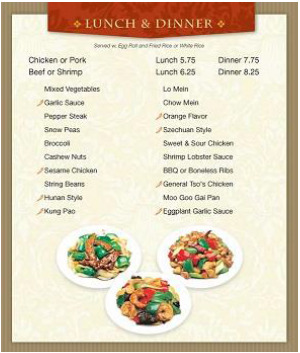 Institutional Menus − It is the menu of meals offered for the staff or students at the college, school, or hostel. It is generally healthy breakfast and/or three course meal with some choice. Name of the Food Item − Preferably in English and in Local language. Short Description on Preparation − A classy description of what exactly the recipient is going to get. The scale of Hotness − In case the dish is savory. Variants − The subcategories of main food item. Price − Cost per unit dish/serving. The menu card must be designed to catch the eyes and must be tempting. The description of food items must be easy to read and understandable. Hot Drinks − They mean tea, coffee, chocolate and their variants, milo, and plain milk. Cold Drinks − Carbonated cold drinks, lemon based drinks, local flavored drinks such as buttermilk, juices, cold coffee, iced tea, mocktails, etc. Name of the Beverage − Preferably in English and in Local language. The Taste and Flavor − To build the mood. Variants − The subcategories of main beverage. Price − Cost per unit serving. If the food service establishment is serving alcoholic drinks, this menu is required. The bar menus contain the list of liquors, cocktails, mixed drinks, bartender's specialties, soft drinks, one plate meals, and snacks. Name of the Drink − Preferably in English and in Local language. The Taste and Flavor − To understand build the mood. Variants − The subcategories of main drink/dish/snack. It must also contain a message for responsible drinking. Food and beverage are paired in such a way that there is a contrast with slightly different intensity so that the taste of each should counter the other and not spoil it. Pairing and advising which drink goes best with the selected dish is one of the charming tasks in food operations. Hot filter coffee South Indian Food The bitterness enhances spices in the food. Hot spiced tea Pakoras and Fritters Tea enhances flavor of their ingredients and cleanses throat after eating this deep fried food. Iced tea Sandwiches, Subs The sharp taste of tea balances mild taste of bread food. Carbonated drink like Coke, Pepsi, or 7Up Pizza To balance the taste of smoky cheese and toppings. Champaign Salty and savory foods. Light and slight sweet taste of Champaign balances the salt. Pinot Grigio white wine Fish steak, chicken steak. The wine flavor compliments non-veg flavor. Pinot Noir Light Red wine Grilled Vegetables and Meats. The wine’s farmyard aroma enhances smoky flavor of grilled dishes. The lifestyle of 21st century people comes with hectic and busy days that may at times forces them to compromise on consuming healthy food. To keep the health well maintained, they people are aware of the importance of healthy food. They carefully choose what they eat. Consuming low fat, low calorie food. Preferring baked food rather than deep fried food. Preferring more leafy vegetables, fruits, and 100% juices. Avoiding consumption of sugar or preferring natural sugars/sweeteners. Preferring food ingredients that are grown organically. Preferring natural drinks such as coconut water, green tea, and fresh juices over carbonated drinks. Caveman’s Diet − Consuming a lot of protein, very less or almost no carbohydrates, no sugar and confectionery. 5 Factor Diet − A US-based actress, Halle Berry, made this diet popular. This diet includes five meals a day, which does not take more than five minutes to be ready on a plate, accompanied by five exercises of five minutes each for five days in a week. Facial Analyst Diet − A facial analyst examines skin, eyes, and hair to arrive at an appropriate diet plan. Raw Food Diet − As the name suggests, it includes consumption of only fruits, salad vegetables, and their juices for some span of time. Fat Flush Diet − To increase the metabolism, this plan of diet recommends avoiding tea, coffee and alcohol, and consuming flaxseed oil, coconut oil, cranberry juice, and vitamins. The commercial food preparation and service outlets need to update themselves on the contemporary diet fads and include diet food on their menu accordingly.